The French Connection is a 1971 American action thriller film directed by William Friedkin. The screenplay, written by Ernest Tidyman, is based on Robin Moore's 1969 non-fiction book The French Connection: A True Account of Cops, Narcotics, and International Conspiracy. It tells the story of New York Police Department detectives Jimmy "Popeye" Doyle and Buddy "Cloudy" Russo, whose real-life counterparts were Narcotics Detectives Eddie Egan and Sonny Grosso, in pursuit of wealthy French heroin smuggler Alain Charnier. The film stars Gene Hackman as Popeye, Roy Scheider as Cloudy, and Fernando Rey as Charnier. Tony Lo Bianco and Marcel Bozzuffi also star. The Three Degrees feature in a nightclub scene. It was the first R-rated movie to win the Academy Award for Best Picture since the introduction of the MPAA film rating system in 1968. [Note 1] It also won Academy Awards for Best Actor (Hackman), Best Director (Friedkin), Best Film Editing, and Best Adapted Screenplay (Tidyman). It was nominated for Best Supporting Actor (Scheider), Best Cinematography and Best Sound Mixing. Tidyman also received a Golden Globe Award nomination, a Writers Guild of America Award and an Edgar Award for his screenplay. A sequel, French Connection II, followed in 1975 with Gene Hackman and Fernando Rey reprising their roles. In Marseille, an undercover police detective follows Alain Charnier, who runs the world's largest heroin-smuggling syndicate. The policeman is assassinated by Charnier's hitman, Pierre Nicoli. Charnier plans to smuggle $32 million of heroin into the United States by hiding it in the car of his unsuspecting friend, television personality Henri Devereaux, who is traveling to New York by ship. In New York City, detectives Jimmy "Popeye" Doyle and Buddy "Cloudy" Russo go out for drinks at the Copacabana. Popeye notices Salvatore "Sal" Boca and his young wife, Angie, entertaining mobsters involved in narcotics. They tail the couple and establish a link between the Bocas and lawyer Joel Weinstock, who is part of the narcotics underworld. Popeye learns from an informant that a massive shipment of heroin will arrive in the next two weeks. The detectives convince their supervisor to wiretap the Bocas' phones. Popeye and Cloudy are joined by federal agents Mulderig and Klein. Devereaux's vehicle arrives in New York City. Boca is impatient to make the purchase—reflecting Charnier's desire to return to France as soon as possible—while Weinstock, with more experience in smuggling, urges patience, knowing Boca's phone is tapped and that they are being investigated. Charnier realizes he is being observed. He "makes" Popeye and escapes on a departing subway shuttle. To avoid being tailed, he has Boca meet him in Washington D.C., where Boca asks for a delay to avoid the police. Charnier, however, wants to conclude the deal quickly. On the flight back to New York, Nicoli offers to kill Popeye, but Charnier objects, knowing that Popeye would be replaced by another policeman. Nicoli insists, however, saying they will be back in France before a replacement is assigned. Soon after, Nicoli attempts to shoot Popeye but misses. Popeye chases Nicoli, who boards an elevated train. Popeye commandeers a car and gives chase. Realizing he is being pursued, Nicoli works his way forward through the carriages, shoots a policeman who tries to intervene and hijacks the motorman at gunpoint, forcing him to drive straight through the next station, also shooting the train conductor. The motorman passes out and they are just about to slam into a stationary train when an emergency trackside brake engages, hurling the assassin against a glass window. Popeye arrives to see the killer descending from the platform. When the killer sees Popeye, he turns to run but is shot dead by Popeye. After a lengthy stakeout, Popeye impounds Devereaux's Lincoln. He and his team take it apart searching for the drugs, but come up empty-handed. Cloudy notes that the vehicle's shipping weight is 120 pounds over its listed manufacturer's weight. They remove the rocker panels and discover the heroin concealed therein. The police restore the car to its original condition and return it to Devereaux, who delivers the Lincoln to Charnier. Charnier drives to an old factory on Wards Island to meet Weinstock and deliver the drugs. After Charnier has the rocker panels removed, Weinstock's chemist tests one of the bags and confirms its quality. Charnier removes the drugs and hides the money, concealing it beneath the rocker panels of another car purchased at an auction of junk cars, which he will take back to France. Charnier and Sal drive off in the Lincoln, but hit a roadblock with a large contingent of police led by Popeye. The police chase the Lincoln back to the factory, where Boca is killed during a shootout while most of the other criminals surrender. Charnier escapes into the warehouse with Popeye and Cloudy in pursuit. Popeye sees a shadowy figure in the distance and opens fire a split-second after shouting a warning, killing Mulderig. Undaunted, Popeye tells Cloudy that he will get Charnier. After reloading his gun, Popeye runs into another room and a single gunshot is heard. Title cards note that Weinstock was indicted but his case dismissed for "lack of proper evidence"; Angie Boca received a suspended sentence for an unspecified misdemeanor; Lou Boca received a reduced sentence; Devereaux served four years in a federal penitentiary for conspiracy; and Charnier was never caught. Popeye and Cloudy were transferred out of the narcotics division and reassigned. In an audio commentary track recorded by Friedkin for the Collector's Edition DVD release of the film, Friedkin notes that the film's documentary-like realism was the direct result of the influence of having seen Z, a French film. The film was among the earliest to show the World Trade Center: the completed North Tower and the partially completed South Tower are seen in the background of the scenes at the shipyard following Devereaux's arrival in New York. Friedkin credits his decision to direct the movie to a discussion with film director Howard Hawks, whose daughter was living with Friedkin at the time. Friedkin asked Hawks what he thought of his movies, to which Hawks bluntly replied that they were "lousy." Instead Hawks recommended that he "Make a good chase. Make one better than anyone's done." Though the cast ultimately proved to be one of the film's greatest strengths, Friedkin had problems with casting choices from the start. He was strongly opposed to the choice of Hackman for the lead, and actually first considered Paul Newman (out of the budget range), then Jackie Gleason, Peter Boyle and a New York columnist, Jimmy Breslin, who had never acted before. [Note 2] However, Gleason, at that time, was considered box-office poison by the studio after his film Gigot had flopped several years before, Boyle declined the role after disapproving of the violent theme of the film, and Breslin refused to get behind the wheel of a car, which was required of Popeye's character for an integral car chase scene. Steve McQueen was also considered, but he did not want to do another police film after Bullitt and, as with Newman, his fee would have exceeded the movie's budget. Tough guy Charles Bronson was also considered for the role. Friedkin almost settled for Rod Taylor (who had actively pursued the role, according to Hackman), another choice the studio approved, before he went with Hackman. The casting of Fernando Rey as the main French heroin smuggler, Alain Charnier (irreverently referred to throughout the film as "Frog One"), resulted from mistaken identity. Friedkin had seen Luis Buñuel's 1967 French film Belle de Jour and had been impressed by the performance of Francisco Rabal, who had a small role in the film. However, Friedkin did not know his name, and remembered only that he was a Spanish actor. He asked his casting director to find the actor, and the casting director instead contacted Rey, a Spanish actor who had appeared in several other films directed by Buñuel. After Rabal was finally reached, they discovered he spoke neither French nor English, and Rey was kept in the film. [Note 2] Ironically, after screening the film's final cut, Rey's French was deemed unacceptable by the filmmakers. They decided to dub his French while preserving his English dialogue. The plot centers on drug smuggling in the 1960s and early '70s, when most of the heroin illegally imported into the East Coast came to the United States through France (see French Connection). In addition to the two main protagonists, several of the fictional characters depicted in the film also have real-life counterparts. The Alain Charnier character is based upon Jean Jehan who was arrested later in Paris for drug trafficking, though he was not extradited since France does not extradite its citizens. Sal Boca is based on Pasquale "Patsy" Fuca, and his brother Anthony. Angie Boca is based on Patsy's wife Barbara, who later wrote a book with Robin Moore detailing her life with Patsy. The Fucas and their uncle were part of a heroin dealing crew that worked with some of the New York City crime families. Henri Devereaux, who takes the fall for importing the Lincoln to New York City, is based on Jacques Angelvin, a television actor arrested and sentenced to three to six years in a federal penitentiary for his role, serving about four before returning to France and turning to real estate. The Joel Weinstock character is, according to the director's commentary, a composite of several similar drug dealers. The most famous shot of the chase is made from a front bumper mount and shows a low-angle point of view shot of the streets racing by. Director of photography Owen Roizman wrote in American Cinematographer magazine in 1972 that the camera was undercranked to 18 frames per second to enhance the sense of speed. Roizman's contention is borne out when you see a car at a red light whose muffler is pumping smoke at an accelerated rate. Other shots involved stunt drivers who were supposed to barely miss hitting the speeding car, but due to errors in timing, accidental collisions occurred and were left in the final film. Friedkin said that he used Santana's cover of Fleetwood Mac's song "Black Magic Woman" during editing to help shape the chase sequence; though the song does not appear in the film, "it [the chase scene] did have a sort of pre-ordained rhythm to it that came from the music." The scene concludes with Doyle confronting Nicoli the hitman at the stairs leading to the subway and shooting him as he tries to run back up them. [Note 4] Many of the police officers acting as advisers for the film objected to the scene on the grounds that shooting a suspect in the back was simply murder, not self-defense, but director Friedkin stood by it, stating that he was "secure in my conviction that that's exactly what Eddie Egan (the model for Doyle) would have done and Eddie was on the set while all of this was being shot." The film was released to critical praise. Film critic Roger Ebert gave the film 4 out of 4 stars and ranked it as one of the best films of 1971. Critic Roger Greenspun said of the film, "the ads say that the time is just right for an out-and-out thriller like this, and I guess that you are supposed to think that a good old kind of movie has none too soon come around again. But The French Connection ... is in fact a very good new kind of movie, and that in spite of its being composed of such ancient material as cops and crooks, with thrills and chases, and lots of shoot-'em-up." As of June 2018, the film holds a 98% "certified fresh" rating on review aggregator website Rotten Tomatoes based on reviews from 56 critics. The sites critical consensus states, "Realistic, fast-paced and uncommonly smart, The French Connection is bolstered by stellar performances by Gene Hackman and Roy Scheider, not to mention William Friedkin's thrilling production." In 2014, Time Out polled several film critics, directors, actors and stunt actors to list their top action films. The French Connection was listed at 40th place on this list. In 2012, the Motion Picture Editors Guild listed the film as the tenth best-edited film of all time based on a survey of its membership. The film has been issued in a number of home video formats. For a 2009 reissue on Blu-ray Disc, William Friedkin controversially altered the film's color timing to give it a "colder" look. Cinematographer Owen Roizman, who was not consulted about the changes, dismissed the new transfer as "atrocious". On March 18, 2012 a new Blu-ray transfer of the movie was released. This time the color-timing was supervised by both Friedkin and Roizman, and the desaturated and sometimes over-grainy look of the 2009 edition have been corrected. While not a sequel, The Seven-Ups (1973) is closely related as it stars Roy Scheider and Tony Lo Bianco, was directed by producer Philip D'Antoni, with a story by Sonny Grosso, and features another famous car chase choreographed by Bill Hickman. The score for this film was also by Don Ellis. 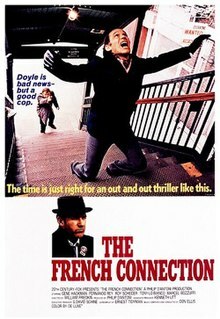 French Connection II (1975) is a fictional sequel. NBC-TV aired a made-for-TV movie, Popeye Doyle (1986), starring Ed O'Neill in the title role. ^ Midnight Cowboy won Best Picture Oscar with an X rating. ^ a b Friedkin recounts his casting opinions in Making the Connection: The Untold Stories (2001). Extra feature on 2001 Five Star Collection edition of DVD release. ^ R42 cars 4572 and 4573 were chosen for the film and had no B subway rollsigns because they were normally assigned to the N subway train. Consequently, they operated during the movie with an N displayed. As of July 2009, these cars were withdrawn from service, but are preserved as part of the Transit Museum fleet. ^ A still shot from this scene is depicted in the movie poster shown at the top of this Wikipedia page. ^ "THE FRENCH CONNECTION (18)". British Board of Film Classification. Retrieved 17 June 2018. ^ "The French Connection". The Numbers. Retrieved 17 June 2018. ^ "The French Connection, Box Office Information". Box Office Mojo. Retrieved January 29, 2012. ^ Solomon, Aubrey (1989). Twentieth Century Fox: A Corporate and Financial History. Lanham, Maryland: Scarecrow Press, p. 167, ISBN 978-0-8108-4244-1. ^ "The French Connection (1971) - William Friedkin". AllMovie. ^ "Turner Classic Movies spotlight". TCM. Retrieved 2014-08-02. ^ Bauer, Alain; Soullez, Christophe (2012). La criminologie pour les nuls (Générales First ed.). ISBN 2754031626. ^ "Top 10 car chase movies - MOVIES - MSNBC.com". MSNBC. Retrieved 2014-08-02. ^ This account of the shooting is described in Making the Connection, supra. ^ ""From 'Popeye' Doyle to Puccini: William Friedkin" with Robert Siegel (interview), NPR, 14 Sep 2006". Npr.org. Retrieved 2014-08-02. ^ "Making the Connection" and "The Poughkeepsie Shuffle", documentaries on The French Connection available on the deluxe DVD. ^ "The French Connection film locations". The Worldwide Guide to Movie Locations. Retrieved May 11, 2013. ^ "The French Connection". Reel Streets. Retrieved May 11, 2013. ^ "Locations for The French Connection". Internet Movie Database. Retrieved May 11, 2013. ^ "The Filming Locations of The French Connection, Then and Now". Scouting NY. 2014-05-21. Retrieved 2016-06-15. ^ Ebert, Roger (January 1, 1971). "The French Connection Review". Retrieved June 17, 2018. ^ Greenspun, Roger (October 8, 1971). "The French Connection (1971)". The New York Times. Retrieved 2014-08-02. ^ "The French Connection (1971)". Rotten Tomatoes. Retrieved June 17, 2018. ^ "The 100 best action movies ever made". ^ "The 20th Annual Golden Globe Awards (1972) Nominees and Winners". goldenglobes.org. Archived from the original on 2010-11-24. ^ Kehr, Dave (February 20, 2009). "Filmmaking at 90 Miles Per Hour". The New York Times. Retrieved 2009-08-08. ^ Jeffrey Wells (February 25, 2009). "Atrocious...Horrifying". Hollywood Elsewhere. Archived from the original on June 2, 2009. Retrieved 2009-08-08. ^ "The French Connection Gets a New Blu-ray Release, New Master". ^ "The French Connection Blu-ray". Collins, Dave (November 29, 2014). "Man linked to heroin ring in '71 film nabbed again". Associated Press. Friedkin, William (April 15, 2003). "Under the Influence: The French Connection". DGA Magazine. Friedkin, William (Fall 2006). "Anatomy of a Chase: The French Connection". DGA Magazine.